Volvo Cars unveils a unique system that can help the car driver avoid the sort of low-speed collisions that are so common in urban traffic and in slow-moving traffic queues. If the driver is about to drive into the vehicle in front and does not react in time, the car brakes itself. The system is called City Safety and Volvo Cars’ aim is to use it to help avoid half of all rear-end collisions. The new system is part of the XC60 Concept and Volvo Cars plans to introduce City Safety on the market within the coming two years. "The system offers benefits to all involved. For the occupants of the car in front, the risk of whiplash injuries is avoided or reduced. What is more, the system can help reduce or sometimes even eliminate the cost of repairs to both vehicles," says Ingrid Skogsmo, director of the Volvo Cars Safety Centre. If the vehicle in front suddenly brakes and the City Safety senses that a collision is likely to take place it will pre-charge the brakes to help the driver avoid an accident by braking or let the driver steer away from a potential collision. However, when the system senses that a collision is imminent, the car will brake automatically through hydraulic pump activation. Statistics reveal that 75 percent of all reported collisions occur at speeds of up to 30 km/h. In addition, the consequences of small impacts are often so limited that not all are reported to the insurance companies. However, even the smallest collisions cost time and money to repair. City Safety is active at up to 30 km/h. If the relative speed difference between the two vehicles is below 15 km/h, the system can help the driver avoid the collision entirely. Between 15 and 30 km/h, the focus is instead on reducing speed as much as possible before the impact. The system keeps a watchful eye on traffic in front of the car with the help of an optical radar system integrated into the upper part of the windscreen at the height of the interior rear-view mirror. It can monitor vehicles that are up to 6 metres in front of the car. City Safety operates at speeds of up to 30 km/h and the system is programmed to respond if the vehicle in front is either at a standstill or is moving in the same direction as the car itself. 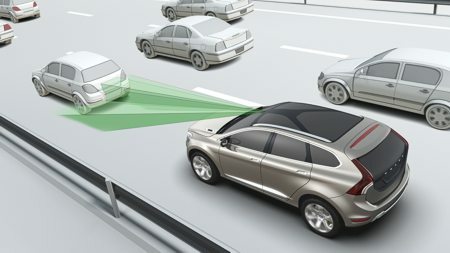 Based on the distance to the object in front and the car’s own speed, the system runs a calculation 50 times per second to determine what braking speed is needed to avoid a collision. If the calculated braking force exceeds a given level without the driver responding, the danger of a collision is considered imminent. In such a case, City Safety helps avoid or reduce the consequences of a collision by automatically activating the car’s brakes or by auto-braking and switching off the throttle. City Safety has the same limitations as all conventional radar systems, that is to say the sensor’s capability can be limited by fog, mist, snow or heavy rain. It is therefore essential to keep the windscreen free from dirt, ice and snow. 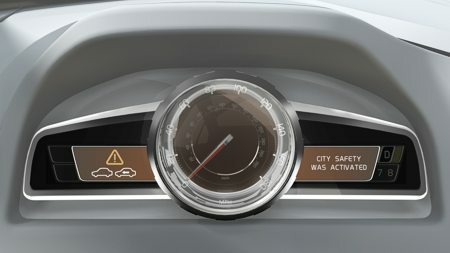 If the sensor is blocked, the driver is alerted via the car’s information display to clean the windscreen. The system works equally well by day or night. "It is important to emphasise that the system does not absolve the driver from driving with adequate safety margins in order to avoid collisions. The automatic braking function is only activated when the system assesses that a collision is imminent. The system then steps in to limit the consequences of – or in some cases totally avoid – the imminent collision," explains Ingrid Skogsmo. Volvo Cars has previously presented active safety systems that help the driver avoid and reduce damage and injuries from collisions. 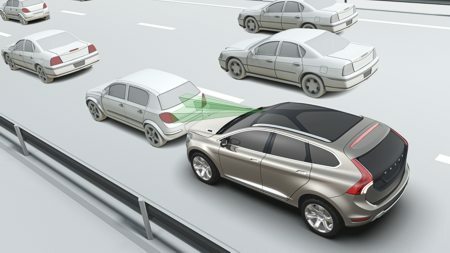 Collision Warning and Brake Support alerts the driver via audible and visual signals if the gap to the car in front is being reduced so quickly that an impact is likely. At the same time, the braking system is pre-charged so that braking is as effective as possible in this emergency situation. 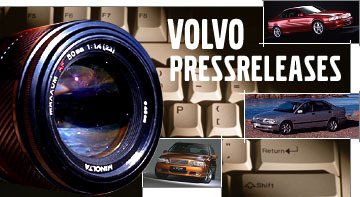 The system was introduced in the new Volvo S80 in early 2006.